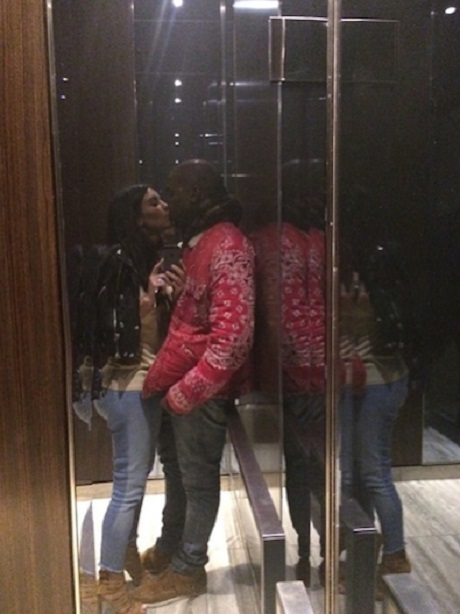 In Kim Kardashian‘s newest selfie, she documents a kiss with her main squeeze, Kanye West. The picture looks only a little bit trashy/creepy; other than that, some might even go as far to say it’s adorable. But do you think Kim is trying to say something else with this image? Do you think, possibly, that she’s attempting to diss a certain group of celebrities who were involved in a rather nasty elevator fight/brawl/scandal? We’re, of course, talking about Jay-Z, Solange, and Beyonce. There’s no hiding the fact that Kim has been desperate to obtain the friendship of Beyonce for ages now. Maybe she’s finally gotten fed up trying to befriend the Queen Bey (and her family) and has resorted to throwing shade upon her instead! Kim Kardashian is the celebrity goddess of #selfies, so much so in fact that she’s publishing an entire photo book composed of them! Honestly, I personally can’t imagine placing an entire book of Kim Kardashian selfies on my coffee table for my guests to enjoy. Unfortunately, the guests I entertain might not be so keen on looking into the eyes of Kimmy K for 352 pages, the length of her upcoming book, Selfish, which hits shelves April 7, 2015. The above selfie supposedly comes sometime after the Teen Choice Awards, where Kim, Kendall, and Kylie accepted the award for Best Reality TV Show. When she took to the Blue Carpet, Kim gave a little speech on how she fears for when North West will be hurled into the world of social media — basically a right of passage for any tween. We’re not trying to start anything here, but it sort of appears that Kim Kardashian is partaking in a bit of cyberbullying herself. What do you think? Are we just making mountains out of mole hills, or is Kimmy trying to take down the Queen? Beyonce, Jay-Z Spend $7K On Baby North West, Generous Or Kinda Cheap?